Over recent years, the European Union (EU) has become the most influential player in the Eastern Partnership countries (EaP). It is both a prominent development actor and a relevant political force in the region. For EaP countries’ minorities this is a particularly hopeful process; with some EaP countries successfully signing Association Agreements with the EU, this relationship provides both the carrot and the stick for the states to put their international commitments into practice and effectively improve the situation of their minorities. 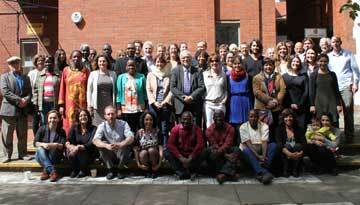 In the course of Minority Rights Group International’s (MRG’s) work with partner minority and human rights non-governmental organizations (NGOs), the need was articulated for the publication of a guide to the EU for minorities. This was explained by the lack of a minority-specific tool for approaching the EU, and the fact that both general and NGO-specific knowledge on the EU is lacking among NGO practitioners as the EU still remains a distant and complex entity. 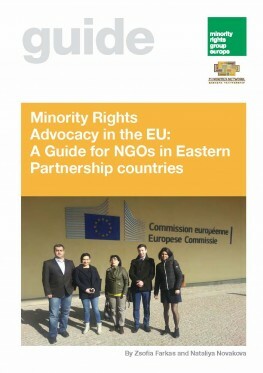 This publication is about minority rights advocacy in the institutional setting of the EaP and the EU. It comprises three sections. The first focuses briefly on the definition of advocacy in general and minority rights advocacy in particular from an NGO perspective in the EU setting. The second maps out the institutional framework in which advocacy takes place, assesses advocacy opportunities in the EU institutional setting in more detail, considering the major EU institutions together with the related national actors, and suggests appropriate advocacy strategies for each institution (the European Parliament, the Council of the European Union, the European Commission [EC] and Civil Society Forum, EU Delegations and EU member states’ embassies in the countries). Finally it lists contacts and resources for successful advocacy in the third section.